Groom Michael is a Sausalito banker. Groom Phillip is an actor/singer with Beach Blanket Babylon, the hilarious long running San Francisco musical production. The couple chose Sausalito Presbyterian Church for their Commitment Blessing. Best Woman Tammi, who usually wears 20 pound hats of the skyline of San Francisco and sings with a big theatrical voice in Beach Blanket Babylon, changed roles for the ceremony as she sweetly sang “We’ve Only Just Begun”. After the presentation of the partners for life, the guests walked down the garden steps for a church reception celebration with lots more singing, a “rainbow” cake and Phillip sitting on top of the piano and serenading his partner with a touching love song. They finished with a dance and everyone joined in. 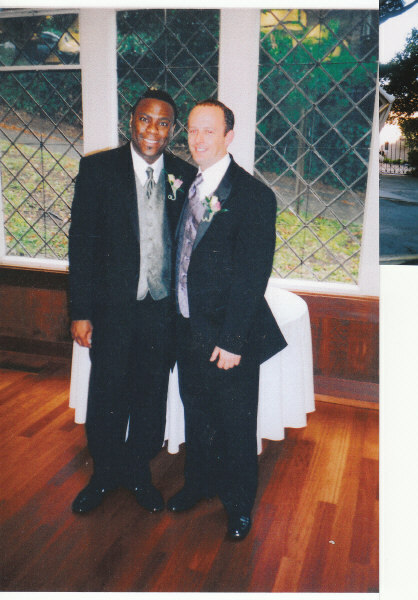 Michael and Phillp love their life together in beautiful Sausalito!